No matter where you live, storm preparedness is important. Hurricanes, floods and summer storms can damage property and endanger lives. The preparations you make ahead of volatile weather can help you recover faster and stay safer during the storm and during clean-up. The Outdoor Power Equipment Institute (OPEI) an international trade association representing small engine, utility vehicle (UTV) and outdoor power equipment manufacturers and suppliers, offers ten questions to ask to be better prepared. What equipment will you need during and after a storm? Survey your property. 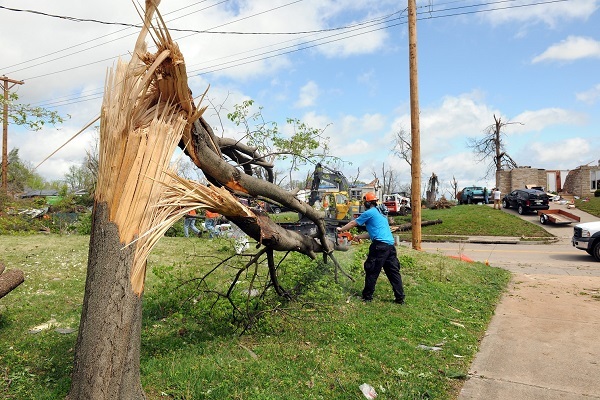 Consider the damage a storm might cause and make a list of what tools might be needed to weather the storm or make repairs afterwards. You might need a chainsaw, pole pruner, generator or UTV. Take time to think through a strategy for clean-up efforts. What outdoor power equipment do you already have and what condition is it in? Make sure equipment is in good working order. If needed, take your equipment to an authorized service center for maintenance or repair. Where is your safety gear for operating the equipment? Avoid the scramble for sturdy shoes, safety goggles, hard hats, reflective clothing, flashlights with working batteries and work gloves. Round them up now and store them in an accessible area with your equipment. Did you review the owner’s manuals for your equipment? Know your machine. The key is to read and understand the owner’s manual. The same kind of machine will vary by manufacturer. Read product manuals to ensure you know how to operate your equipment safely. If you don’t have the printed manuals on hand, you can look them up online. Save an electronic version to your computer for reference. Do you have the right fuel on hand for your outdoor power equipment? Fuel stations may be closed after a storm, so it’s important to have the proper fuel for your equipment. Store your fuel in an approved container. Use the type of fuel recommended by your equipment manufacturer. It is illegal to use any fuel with more than 10% ethanol in outdoor power equipment (for more information on proper fueling for outdoor power equipment visit www.LookBeforeYouPump.com). Do you know basic safety precautions? There are some fundamental safety tips everyone should follow year-round. For instance, observe the safety zone, which means keeping bystanders and power lines (those above you and any that might have fallen down) at least 50 feet away from your work area. Also, if using a chainsaw, understand kickback, which may happen when the moving chain at the tip of the guide bar touches an object, or when the wood closes in and pinches the saw chain in the cut. Always stand with your weight on both feet, and adjust your stance so you are angled away from the blade. Hold the chainsaw with both hands. Never over-reach or cut anything above your shoulder height. Always have a planned retreat path if something falls. Read more about chainsaw safety. If using a portable generator, do you know to use it safely and have a place outside for it to run? Generators should never be used in an enclosed area or placed inside a home or garage, even if the windows or doors are open. Place the generator outside and away from windows, doors, and vents that could allow carbon monoxide to come indoors. It should have plenty of ventilation. Keep the generator dry and do not use it in rainy or wet conditions. Before refueling, turn the generator off and let it cool down. If you have a UTV do all operators in your home know how to drive it with caution? It’s important that anyone operating the vehicle know how to follow safety procedures. Keep the vehicle stable and drive slowly. Do not turn the vehicle mid-slope or while on a hill. Do you know how to safely use a pump to remove water after a flood? Never operate a centrifugal pump without water in the pump casing. A self-priming pump creates a partial vacuum by purging air from the intake hose and pump casing. All self-priming pumps require water to be added to the pump casing to start the priming process. Is everyone in your home or business aware of safety procedures when outdoor power equipment is in use? Keep bystanders, children and animals out of your work area. Do not allow other people near outdoor power equipment when starting the equipment or using it. For more safety tips for outdoor power equipment, click here. Want more news from OPEI? Click here!